"Reilly’s debut novel explores how a love evolves as responsibilities mount for two parents with three very different daughters…deft in her characterizations…full of imaginative anecdotes and vibrant details…Reilly’s first novel is touching and nostalgic." "Sunday’s on the Phone to Monday is an energetic, captivating, and lyrical debut. Here is a writer with a wonderfully eccentric way of seeing the world, weaving a family story both whimsical and profound, in which each character is dealt with tenderly, and each sentence is an adventure. Christine Reilly is a talent to watch." "Reminiscent of Lorrie Moore, and J.D. Salinger, and “Mr and Mrs Bridge,” Sunday's on the Phone to Monday is a beautiful thing, the kind of book a poet would dream a novel was." 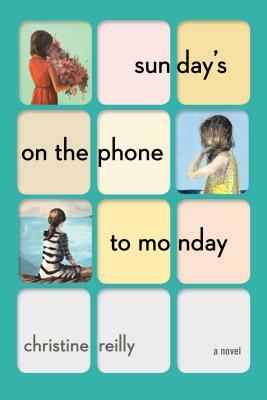 "Sunday’s on the Phone to Monday is a prismatic and moving exploration of how the past can haunt, motivate, and ultimately heal us—or in the words of Natasha Simone, “Memory can be like medicine.” With great empathy and a keen eye for the offbeat detail, Christine Reilly depicts a family unique in its troubles but universal in its longing to overcome them. Reilly is masterful in her illumination of the inner lives of her characters." “With subtle genius and a wide-open heart, Christine Reilly invites us into a world that is at once strange and familiar. A stunning debut." "Sunday's on the Phone to Monday is a fantastic love letter to New York City. This is a multi-generational story of death and life, illness and wellness. Reilly is the undisputed master at spinning poetry into prose. Her words are arresting, poignant, and searingly optimistic." "This whimsical, bittersweet debut novel recalls the work of filmmaker Wes Anderson, both in subject (a complicated, tightknit family full of smart, worried people) and in style (full of quirky, impossible-to-ignore formal choices)." "Christine Reilly’s shimmering debut hurls us into the beating center of the Simone family, and our attachment is immediate and lasting. Both tender and dark, big-hearted and heart-breaking, Sunday’s on the Phone to Monday is a book you won’t forget, filled with quiet power and roaring truths." "A compelling family tale rich in vivid and relatable struggles." "A novel that tells the story of one family; how each family member's life diverged from the hopes and expectations they had for themselves, and how together they'll survive the loves and losses that life holds." — Bustle in "11 Books You'll Be Hooked On From The First Line"
"An intimate tale of love and mending." — Harper's Bazaar in "The Best Books to Read This Winter"
"A sharply observed and bittersweet family romance with a rock ’n’ roll heart.... Reilly’s dreamy, slipstream style dazzles." "Fiction has a longstanding affection forcomplicated New York families (the Glasses and the Tenenbaums come to mind),and the tribe of five at the center of Christine Reilly’s rich debut is nodifferent...Do novels have soundtracks? If so, we’d want to stream this one."